I observed 9 wild chimpanzees in Bossou, Guinea, daily between 06:30 and 17:00 h from January 11th to March 4th 2012, with the help of five research assistants. Location data was automatically collected using a GPS device at 1-minute intervals throughout the observation, to calculate the amount of time that chimpanzees spent in each habitat type. Air temperature and relative humidity were measured by a digital thermohygrometer. Moreover, chimpanzee's behavior was recorded in close distance using sensor triggered cameras at15 points where chimpanzees used intensively. As the result, chimpanzees tended to stay in forest at the morning, when the air temperature relatively decreased. In contrast, chimpanzees became active in the afternoon according to the increase of the temperature. 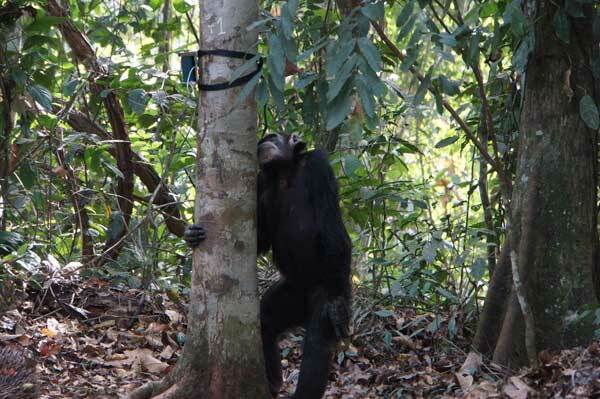 Sensor-triggered cameras were useful for collecting video clips of chimpanzee's behavior in all-occurrence procedure. 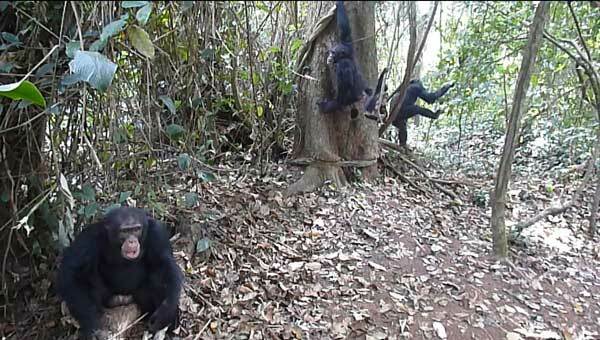 The video clips revealed that chimpanzees visited water drinking sites frequently after consecutive sunny days. I also used sensor-triggered cameras for studying the relationship between food availability and the visit to fruiting trees by chimpanzees. Those data will be analyzed for better understanding of thermoregulatory behavior of wild chimpanzees in response to microclimate and food availability in their habitat. chimpanzee checking a sensor-torrigered camera. chimpanzees at a water drinking site.